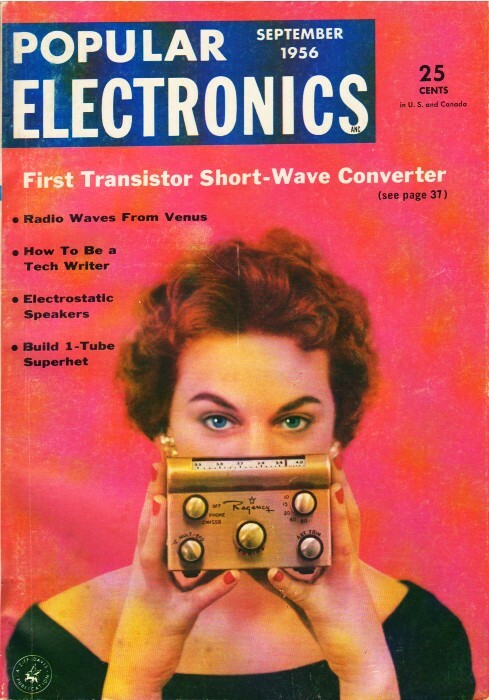 Early investigations into RF signal atmospheric 'ducting' was reported in this 1956-era article in Popular Electronics. Ducting effects were first noticed during World War II when Nazi broadcasts from occupied Paris were received occasionally in London. Scientists discovered that a small change in the humidity of the air near the surface has the effect of trapping radio waves, a trapping process dubbed "ducting." These waves are conducted as if they were inside of a metallic waveguide. Research by the U.S. Army Signal Corps determined a sudden temperature rise of around 50 to 200 feet above the surface appears to have the strongest effect. Weather tests are being conducted by Army to analyze effects of temperature and humidity changes on microwave transmissions. 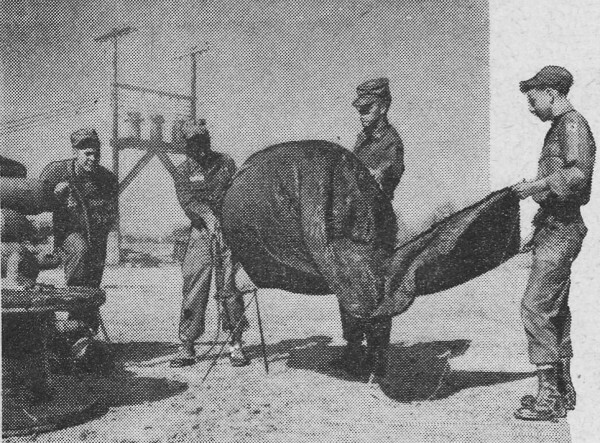 At left, members of meteorological team prepare "Kytoon" - a helium-filled nylon-covered balloon - for ascent. 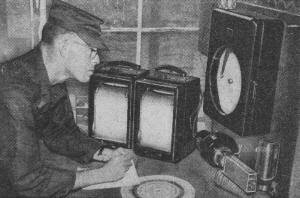 The Army Signal Corps is carefully watching weather effects on microwaves with an eye towards "seeing" beyond the horizon. Normally, microwaves - used by, u.h.f. TV stations - can only travel from transmitting points to the horizon, or within line of sight. However, certain types of weather conditions trap these radio waves and curve ,them around the horizon. 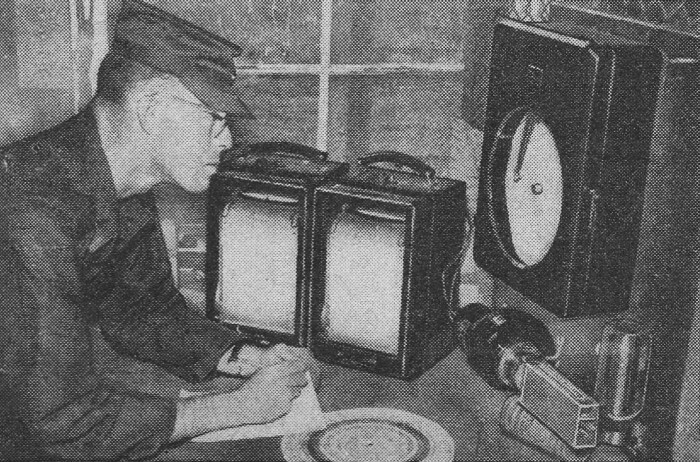 "Kytoon," carrying a "Wiresonde" which records temperature and humidity, rises in front of 200' tower containing electronic equipment used to measure air conditions. This weather balloon can go as high as 1500 feet. Personnel of the Aviation and Meteorological Dept., Army Electronic Proving Ground, Fort Huachuca, Arizona, are interested in determining the exact constitution of these unusual conditions. Electronic measuring instruments have been developed that will detect minute changes in the temperature and humidity of surrounding air. Wind direction, velocity and humidity are checked on instruments located in base of tower. Testing takes place at Gila Bend, Arizona. Scientists have discovered that a small change in the humidity of the air near the surface has the effect of trapping the radio wave. Microwaves caught by trapping are said to be "ducted" - or passed along as if they were inside of a metallic wave guide. A sudden temperature rise some 50 to 200 feet above the surface appears to have the strongest effect. The Signal Corps needs to know the extent of these effects to judge whether or not microwave transmissions can be intercepted by an enemy. During World War II ducting was suspected when TV pictures from the Nazi-held transmitter in Paris could be seen across the English Channel - to the military advantage of the British.